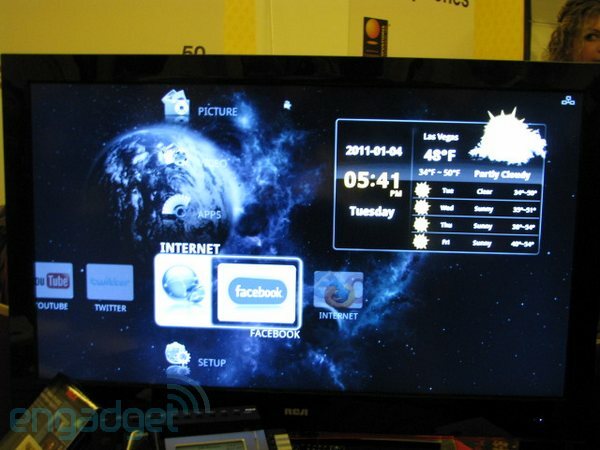 Just like the slew of tablets that have found their path to store shelves without official blessing from Google or access to the Android Market, RCA has chosen to go its own way People of Lava-style with this prototype Android TV, due out later this year. Obviously very early in development, it was unfortunately devoid of apps other than Picasa and a simple weather widget, and used pretty standard remote keys to guide a mouse arrow around the screen and keyboard. You can check out the video after the break to confirm, but with the official Google TV products already experiencing their own growing pains it's tough to get behind a lone challenger. RCA plans to show off some 3D products and Blu-ray players at its booth to go along with this and its mobile TVs, we'll see if we're more impressed later on this week. Watch video below. Click link.